Flottman Company, along with Quad Packaging, is a founding partner of the Rxperts Printed Packaging Group, a complete packaging supplier. For over 20 years the Rxperts Group has serviced the pharmaceutical, medical device and consumer packaged goods (CPG) industries with complete packaging solutions, including folded inserts, labels and folding carton production. 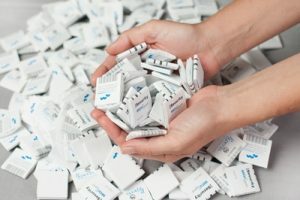 The Rxperts Packaging Group Alliance enables you to consolidate secondary packaging components, including Food and Drug Administration (FDA) compliant documents, labels and/or cartons into a single order and point of contact. This allows for operationaland economic ef ciencies withnew product launches and ongoing commercial supply. With over 100 years of combined service to the medical device, pharmaceutical and nutraceutical industries, we understand the needs of your inserts, labels and packaging and we conform to the multiple FDA requirements. Our partners are regulated and industry-audited, and they mirror our commitment to the highest- quality standards for production,veri cation and security. This allowsus to provide complete beginning- to-end solutions and services. In an effort to outpace the Federal Government's pending Track & Trace compliance regulations for pharmaceutical outserts, Flottman Company now features a track and trace, serialization, and coding device for inline production. Sequential printing and database congruency will individualize each commissioned component while maintaining complete tracking documentation. 2D barcode tracking enables us to reconcile the insert, label or carton seamlessly to satisfy the Drug Supply Chain Secuity Act’s (DSCSA) compliance regulations. Our technology allows you to track and trace your product throughout your distribution system. Flottman Company maintain a finger on the pulse of this industry in order to best serve you. Our employees complete regular training to stay on top of new technology and practices. We also hold memberships to multiple printing and pharmaceutical organizations, including the Pharmaceutical Printed Literature Association (PPLA), the Specialty Pharma Association (SPA) and the Printing Industries of America to name a few.